The creator of a unique and fascinating sound, Orchestre Poly-Rythmo is one of Africa’s most celebrated orchestras. The author of hundreds of recordings, they are one of the continent’s most prolific and after five decades, they are also the oldest active African orchestra. The Orchestre used influences originating from traditional Beninese music, American soul and funk, Nigerian afrobeat, Congolese rumba, Ghanaian high-life, French pop and Afro-Cuban rhythms and combined them with lyrics that broach subjects such as the evolution of Beninese society and its ills, as well as the complexities of love. 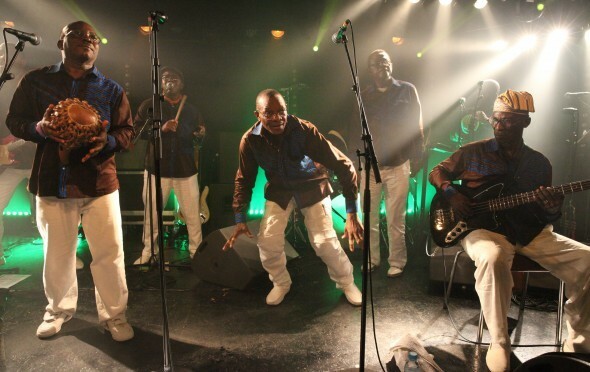 Despite strong competition from the other formations of the fertile Beninese music scene, the Poly-Rythmo rapidly rose to the top of the modern African orchestras. From 1969 to the mid-1980’s, the orchestra published hundreds of EPs and dozens of albums. Their new album was finished in June 2016 and opens a new chapter in the history of the Poly-Rythmo. These ten songs feature compositions by Vincent Ahehehinnou, and also by historic members Loko Pierre and Gustave Bentho. The band went back to the Satel Studio, one of the most legendary studios of the African continent to put down the record. It is where the history of the band was written, when the Poly-Rythmo invented afrobeat at the same time as Fela Kuti who they often played with in Lagos and Cotonou. An instant Afrobeat classic, Madjafalao (be careful) sets the tone of this generous record. The musicians of the Poly-Rythmo eloquently express the diversity of their talents. Remarkable percussion, striking brass formation and a glorious chorus underline the supple vocals of Vincent Ahehehinnou who embodies this richly passionate album.